This game was a truly unique experience. At what is usually a down time for games as developers and distributors gear up for Christmas, Ubisoft dropped this wonderful gaming experience in our laps. Available on Xbox Live, the Xbox One, and the Playstation Network, it is downloadable only at a well-worth-it cost of $14.99. On its face, this is an old-school platformer with puzzle elements. However, it turned out to be much more than that when played. Set during World War I, it is a heartwarming story about four characters from different backgrounds whose paths are wholly intertwined. Karl is a German living in France. He is married to Emily and they have just had a son, Victor, when the war breaks out after the assassination of Archduke Francis Ferdinand. As Germany and France declare war against one another, many German citizens are deported from France, including Karl. Like so many others, he is drafted into the German army against his will. Throughout the game, his greatest wish is to return home to his wife and young child. Emile is Karl's father-in-law. More importantly, he's a Frenchman. Even though he is fairly old, he is also drafted into the army, but on the French side. During the war, he sharers Karl's worries about Emily and Victor. Both he and Karl are able to share their experiences with their daughter/wife through letters. It was one of the only ways to communicate during the Great War. Freddie is an American soldier that has enlisted in the French army. He is out to kill the infamous German military commander, Baron Von Dorf. Von Dorf led a bombing campaign that killed Freddie's wife and he is out for revenge, no matter the cost. He befriends Emile in the process as they both share the same target, since Karl has become Baron Von Dorf's zeppelin pilot. They are both joined by a dog who is used to solve many of the game's puzzles. From Belgium, Anna joins the war effort as a nurse in the Red Cross. Her starry-eyed optimism is soon dashed as the horrors of war take their toll on her dreams of healing and helpfulness. Even though the massive death toll is overwhelming, Anna does her best to help all the soldiers she can, one injury at a time. In her travels, she saves Karl, Emile, and Freddie at various points throughout the game. In the early fighting the German army made swift progress. After invading Belgium, they marched on Paris in late August. French troops retreated en masse and units were outflanked and repelled, taken prisoner, or killed. The months of August to September 1914 marked the bloodiest period of the war with over 180,000 French casualties alone. The French authorities described the debacle as an organized retreat; the war to win over public opinion had begun. These facts were paired with real pictures from the period, giving them particular depth of meaning. The "War to End All Wars" was one of, if not the most, pointless and bloody protracted stalemates in modern times. Trench warfare paired with technology to kill more humans for less ground than at any other time in recorded human history. The soundtrack is by a group of composers that were unknown to me. Most of it is classical with the majority being played on a piano, although a few contained full orchestration. All of it was amazing. I've never played a game and immediately gone to iTunes to buy they soundtrack before, but I'm listening to it as I type this even now. I've never played a game before in which the music was so good as to almost be another character. Even if you don't buy the game, take a listen to the soundtrack. While this game isn't as long or as graphically stunning as many of the RPGs available today, it is just as touching. 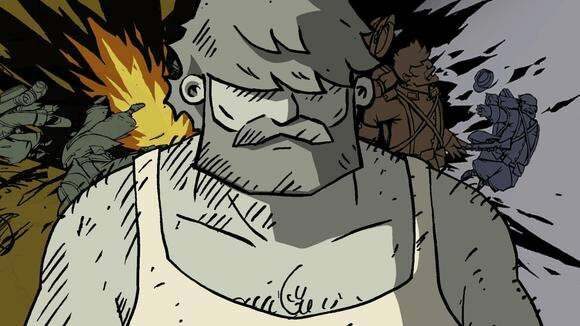 Experientially, it was like playing a graphic novel with the depth of feeling of Maus. I cannot recommend this game enough. You won't be disappointed. As many of our regular readers will know, I like a story-driven game more than one with mind-blowing graphics, which is probably the reason this game hit me so hard. Not only is it fun to play without being overly difficult, as some platformers can be, the plot is second-to-none. 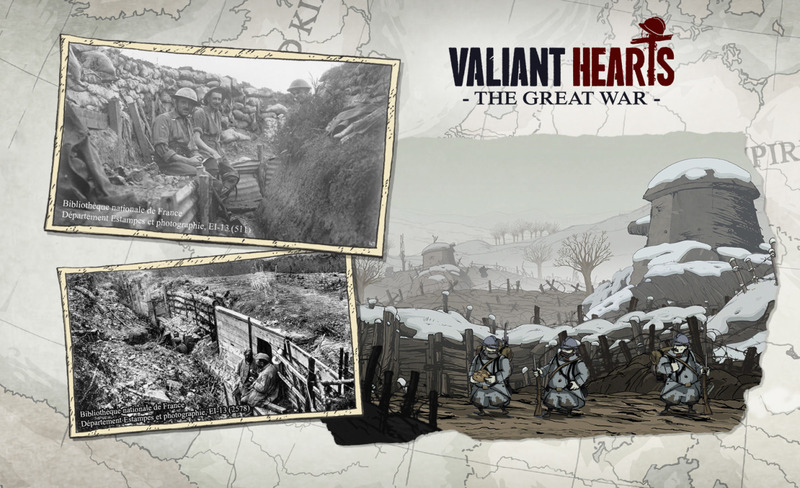 If you give this game a chance, I suspect you will be as taken in by it as I was, falling for the character development and enjoying a quality history lesson at the same time. 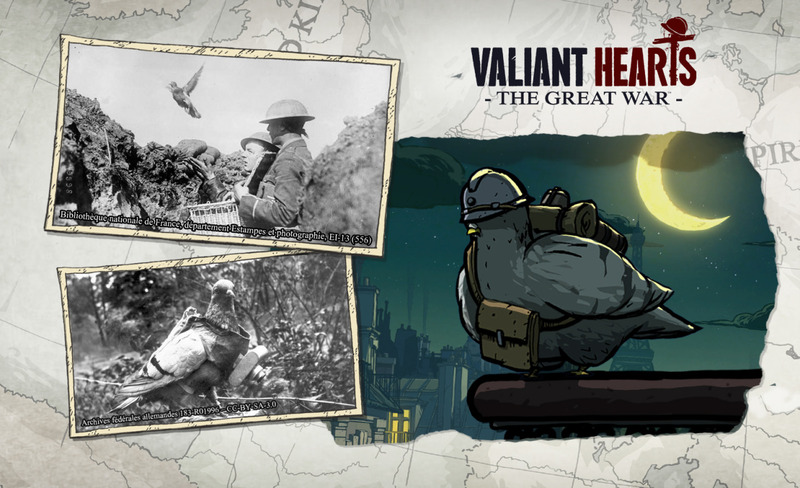 If you're just sitting around playing another round of Titanfall, give yourself a break and try Valiant Hearts. It may not be in the same league graphically, but what it lacks in pixels per square inch, it more than makes up for in emotion. Penalties: -1 for being slightly repetitive in the puzzles. It never became truly annoying, but some of the puzzles were a bit overused, particularly Anna's. Bonuses: +1 for the best story line I've played on the Xbox One, bar none.